The PKI 6200 protects private information and supports cell phone restrictions, whether in hospitals, power plants, airports, computer rooms or any other government and military office. 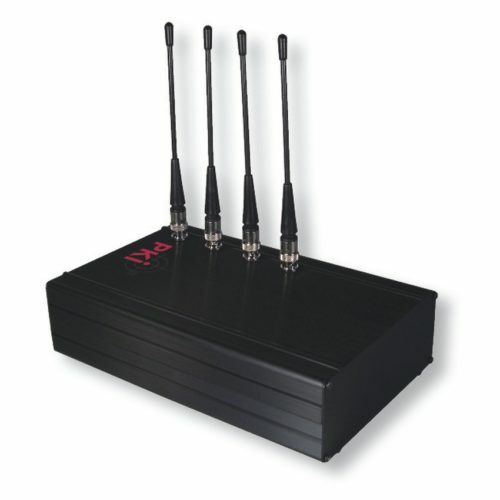 It detects the transmission signals of four different bandwidths simultaneously. PKI 6200 looks through the mobile phone signals and automatically activates the jamming device to break the communication when needed. Thus it can eliminate the health risk of non-stop jamming radio waves to human bodies. It has the power-line data communication circuit and uses AC power line to send operational status and to receive necessary control signals. Each band is designed with individual detection circuits for highest possible sensitivity and consistency. The PKI 6200 features achieve active stripping filters, designed for high selectivity and low false alarm are implemented.